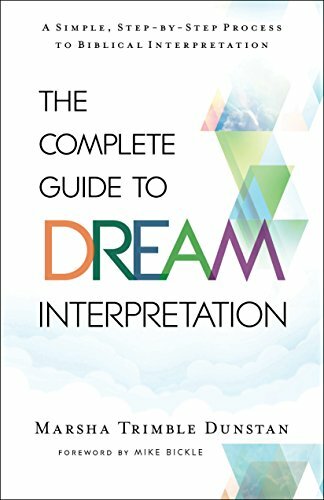 In The Complete Guide to Dream Interpretation, Marsha Trimble Dunstan offers readers a simple guide to understanding and interpreting dreams. In the book, Dunstan reviews her own journey as a Christian trying to uncover the truth about dreams, answers common questions about dream interpretation, reviews the steps to dream interpretation, explains the types of dreams, and then offers readers several examples from her experience to illustrate the process. The book concludes with an extensive, though not exhaustive, interpretative dictionary with common symbols. The dictionary lists many possible meanings for a symbol, including reference Bible verses. I enjoyed the tone of this book, which, while affirming that God does speak through dreams, also cautions readers that not every dream is from Him and that dreams must be carefully interpreted with the help of Scripture and the Holy Spirit. I also appreciate the constant reference to referring to Scripture and prayer in order to accurately interpret dreams. If you are wondering whether your dreams mean something or would like to learn more about dream interpretation, I encourage you to give this book a read. PS Looking for more resources? Check out this post. Disclaimer: I received a free copy of this book from Chosen in exchange for my honest review.